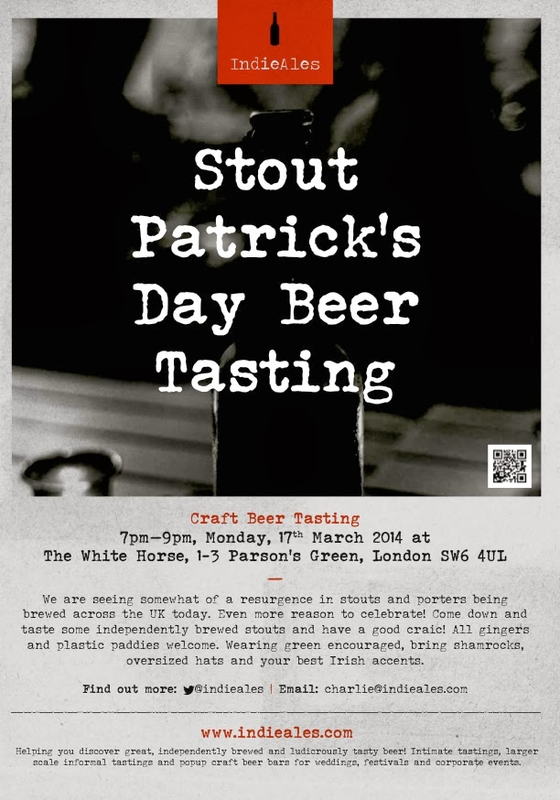 This St Patrick's Day Indie Ales are holding a really imaginative tasting - a series of independently produced stouts and porters. It's at the White Horse in Parson's Green, and it looks like it'll be a lot of fun, and very interesting too. Really looking forward to this one! "Is St Patrick's Day all about the Guinness? Probably, but t'befair the British invented the black stuff (porters and stouts) way before Mr Arthur Guinness started churning out barrel upon barrel of his highly marketed dry stout. Luckily we are seeing somewhat of a resurgence in stouts and porters being brewed across the UK now. Surely this is the real reason to be celebrating? Not convinced? Ok, well come down to taste some independently brewed stouts and have a good craic! We may even throw in a bit of Guinness purely for historical and tasting interest. All gingers and plastic paddies welcome. Wearing green encouraged, bring shamrocks, oversized hats and your best Irish accents. Everyone's Irish on 17th March"